No plucking or killing involved in making Eiderdown comforter and bedding. The females instinctively and willingly line their nest with about 20 grams of down that they plucked from their breast to keep the eggs warm and safe from harsh climatic conditions. These ducks are free and choose to come back to the same areas year after year. When the ducks leave their nests “harvesters” collect the down and sell it to manufacturers of Eiderdown comforters and other bedding. Icelandic Eiderdown farming is a multi million dollar industry. 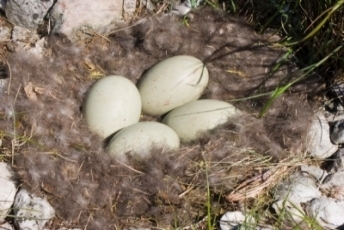 The Canadian Wildlife Service reports in an article, Québec Management Plan for the Common Eider, that the Société Duvetnor and the Société Protectrice des Eiders de L'Estuaire invest their humble proceeds towards protecting nesting grounds and the survival of the species. ...and the fact that the down is hand harvested, washed, and crafted, alone make this an unbelievable product with an expensive price tag. Add the fact that an Eiderdown comforter is the softest, most insulating and lightweight down, covered in luxurious high thread count fabrics makes it a dream for most and the ultimate delight for those enjoying an exclusive lifestyle. Return from this cruelty free Eiderdown Comforter and bedding page to the Down Bedding Delights home page.